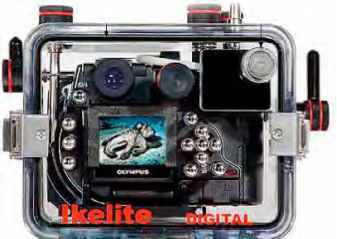 To extend the capabilities of the digital SLR cameras Ikelite has designed a new underwater housing. This housing is injection molded of clear polycarbonate for strength, visual access to the camera, lcd screens and camera controls. The ergonomic design places camera functionality at your fingertips for the ultimate in creative control. 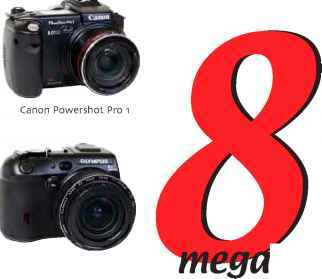 The interchangeable port system accommodates a wide variety of lenses from super-wide angle to supermacro. The rubber handles offer excellent grip and a quick release system for Ikelite's new SA-100 Arm system. An external Ikelite connector is provided to connect single or dual Ikelite Substrobes. 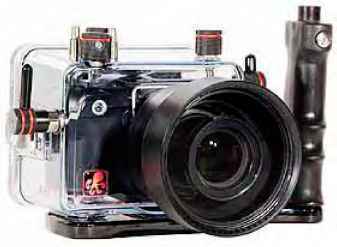 Ikelite also offers a full line of housings for Non-SLR digital cameras. Beginner, amateur, or pro, simply get an Ikelite housing for your favorite digital camera. Choose from Canon, Nikon, Olympus or Sony, Ikelite makes housings for several camera models from each of these manufacturers. 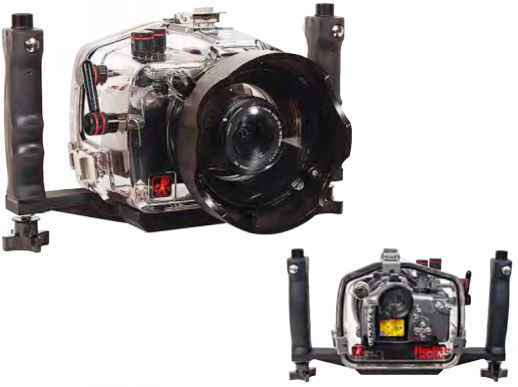 Ikelite supports their underwater digital housings with a full line of accessories. Choose from trays with single or dual handle and quick release of strobes. The DS50 Substrobe is ideal for cameras with zoom lenses or choose the DS125 for use with wide-angle lenses. Many Nikon and Olympus models offer true TTL lighting exposure, or use our EV-Controller that gives 10 power settings in 1/2 stop increments for complete manual lighting control. Ikelite also offers a choice in versatile arm systems to meet your needs and budget. Ikelite's new housing for the Olympus C-8080 includes special conversion circuitry to utilize the outstanding Olympus TTL system without wasting camera battery power and generating the heat of operating the camera built-in strobe which can not be utilized. This is not a "watching" the camera strobe system. This is real Olympus TTL control with a sync cord, allowing optional Ikelite DS-50 and DS-125 SubStrobes to provide actual Olympus TTL automatic exposure dictated by the camera when attached with a single#4103.51 or #4103.52 dual sync cord. Sealux Nikon D70 housing window on top of the camera is easy to see as is the LCD monitor. An optional DS series Ikelite digital SubStrobe improves the photographs and accentuates the underwater colours. 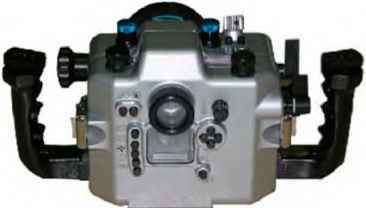 DS-50 and DS-125 digital SubStrobes can also be used with the Manual Controller when connected by sync cord, providing ten power settings. 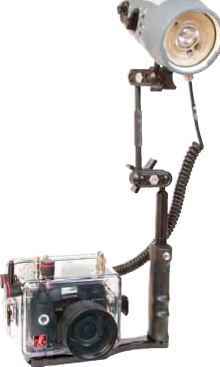 Older non-digital Ikelite SubStrobes can be used with a sync cord, operating in their manual mode only. The comfortable Release Handle and Tray included allows easy attaching and removal of SubStrobe mounting arms at the touch of a button. The heavy duty thick wall housing is molded of corrosion free clear polycarbonate and operates safely to 200 feet. Camera and housing complete weighs less than 7 pounds. Housing measures 7" wide, 10.25" wide with removable tray and handle attached. Front to back measurement is 8" including lens port and knobs. height is 6.5" including push buttons and hardware. 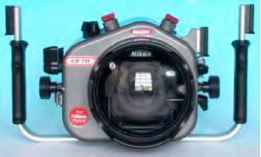 Sealux have designed the precision-fit housing CD 70 so that you have total control underwater. The housing is aluminium, milled from solid, hard-anodised and Teflon coated. One T-piece is provided for flash arms and there are two additional ones on the handles. There are three windows for monitor viewing, display and selector functions and one Nikon flash connection with fixed contacts. 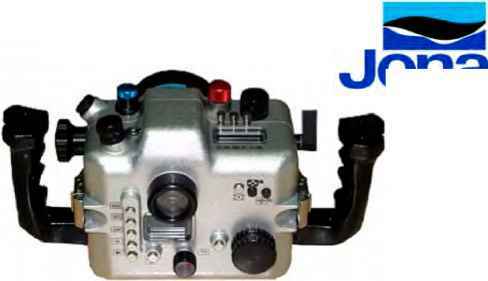 There are controls for On-Off, shutter release, flash synchronisation, exposure correction, key for display illumination, front and rear setting gear, selector of functions, selector of measuring system, zoom / focusing, aperture, flash capacity correction. AE-L, AF-L can be operated easily together with the shutter release. Functions on the rear side: BKT, ME, monitor, menu, ISO, White Balance, Enter, multifunctional selector, delete key. 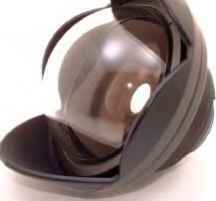 Inon Japan announces development of the UFL-165AD Underwater Fisheye Conversion Lens, the latest addition of the AD Mount Lens series, which includes the UWL-105AD Wide Conversion Lens and the UCL-165AD Close-up Lens. 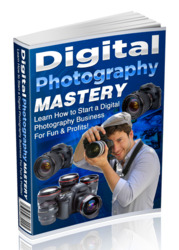 imaging, not previously possible with housed digicams. Inon AD Bayonet Mount permits quick and easy 'one touch' underwater attachment and removal. 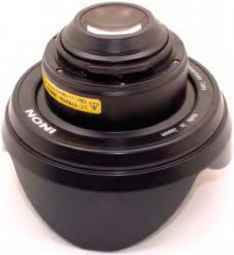 Inon AD Mount Base Adapters available for many popular digital camera housings. Nikon - Canon - Fuji. THe Housing With OceAN Optics. system accessories combine to make Subal the first choice of the discerning underwater photographer who demands durability, reliability, versatility and value for money. For the digital age, Subal present their housing range for the Nikon D70 and D100, Canon D30, D60, 10D and IDs and the Fuji S2 Pro. Subal also offer housings for the Nikon SB80 and 800 and Canon 550EX speedlights for convenient TTL automation. All backed up by Ocean Optics, sole Uk representatives for Subal since 1991.